Arduino Industrial 101 is an Evaluation board for Arduino 101 LGA module. The ATmega32u4 microcontroller is integrated in the baseboard. The module supports a Linux distribution based on OpenWRT named LininoOS. The board has built-in WiFi (IEEE 802.11b/g/n operations up to 150Mbps 1×1 2.4 GHz), 3 GPIOs (of which 2 can be used as PWM Outputs), 4 Analog Inputs, 1 USB, 1 Ethernet signal on pin headers and a built-in DC/DC converter. Check out the assembling guide and simply connect your board to a computer with a micro USB cable to get started. The RAM and the storage memory are externally connected. The Industrial 101 has 64 MB of DDR2 RAM and 16 MB of flash memory. The flash memory is preloaded in factory with a Linux distribution based on OpenWrt called Linino OS. You can change the content of the factory image, such as when you install a program or when you change a configuration file. You can return to the factory configuration by pressing the “USER1” button for 30 seconds. LED: 13. There is a built-in LED connected to digital pin 13. When the pin is HIGH value, the LED is on, when the pin is LOW, it’s off. There are several other status LEDs on the Industrial 101, indicating power (PWR), WLAN connection, WAN connection,TX and RX. Analog Inputs: A0 – A3 and A7 (on digital pins 6). The Industrial 101 has 4 analog inputs, labeled A0 through A3, all of which can also be used as digital i/o; and A7 is on digital i/o pin 6. Each analog input provide 10 bits of resolution (i.e. 1024 different values). By default the analog inputs measure from ground to 5 volts, though is it possible to change the upper end of their range using the AREF pin and the analogReference() function. USER1: connected to GP20 MIPS side and used to reset Wlan.This button has a double feature. Primarly serves to restore the WiFi to the factory configuration. 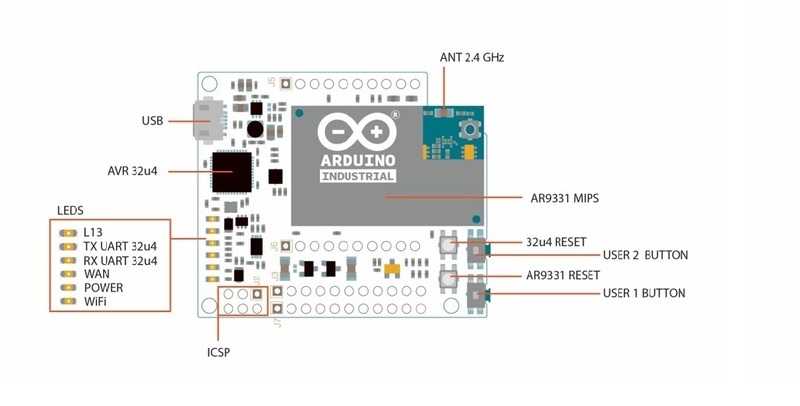 The factory configuration consist to put the WiFi of the Industrial 101 in access point mode (AP) and assign to it the default IP address that is 192.168.240.1, in this condition you can connect with your computer to the a WiFi network that appear with the SSID name “Arduino-Ind-101-XXXXXXXXXXXX”, where the twelve ‘X’ are the MAC address of your Industrial 101. Once connected you can reach the web panel of the Industrial 101 with a browser at the 192.168.240.1 or “http://arduino.local” address. Note that restoring the WiFi configuration will cause the reboot of the linux environment. To restore your WiFi configuration you have to press and hold the WLAN RST button for more 5 seconds but less 10 second. When you press the button the WLAN blue LED will start to blink and will keep still blinking when you release the button after 5 seconds indicating that the WiFi restore procedure has been recorded. The second function of the USER1 button is to restore the linux image to the default factory image. To restore the linux environment you must press the button for 30 seconds. Note that restoring the factory image make you lose all the files saved and softwares installed on the on-board flash memory connected to the AR9331. Arduino Ciao is an easy-to-use and powerful technology that enables Arduino sketches to communicate intuitively with the “outside World”. 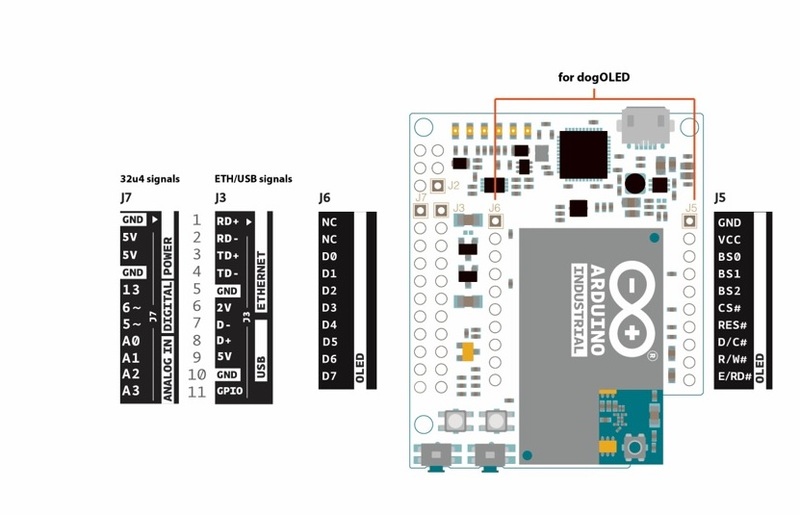 It aims to simplify interaction between microcontroller and Linino OS, allowing a variety of connections with most common protocols, third-party services and social networks. The onboard Ethernet (you need the “Ethernet add-on” for example dogrj45) and WiFi interfaces are exposed directly to the AR9331 processor. To send and receive data through them, use the Bridge or Ciao library. The Industrial 101 can be programmed with the Arduino software (download). Select “Arduino Industrial 101 from the Tools > Board menu (according to the microcontroller on your board). Rather than requiring a physical press of the reset button before an upload, the Industrial 101 is designed in a way that allows it to be reset by software running on a connected computer. The reset is triggered when the Industrial 101’s virtual (CDC) serial / COM port is opened at 1200 baud and then closed. When this happens, the processor will reset, breaking the USB connection to the computer (meaning that the virtual serial / COM port will disappear). After the processor resets, the bootloader starts, remaining active for about 8 seconds. The bootloader can also be initiated by pressing the reset button on the Industrial 101. Note that when the board first powers up, it will jump straight to the user sketch, if present, rather than initiating the bootloader. Because of the way the Industrial 101 handles reset it’s best to let the Arduino software try to initiate the reset before uploading, especially if you are in the habit of pressing the reset button before uploading on other boards. If the software can’t reset the board you can always start the bootloader by pressing the reset button on the board.